Cristiano Ronaldo is all about some having fun. He lives his life to the fullest. And, now that Ronaldo is back from his big matches, he is enjoying himself. After Portugal’s loss in the Confederations Cup, Ronaldo came home to meet his new babies, born while he was still playing for his country. Since his return, he has been enjoying himself. He has posted several pictures of himself and his new twins, his three sons, his friends, and much more. In fact, Real Madrid seems a little upset with all his enjoyment, as he has not yet made any contact with them to convey his interest in leaving or staying back at Real Madrid. 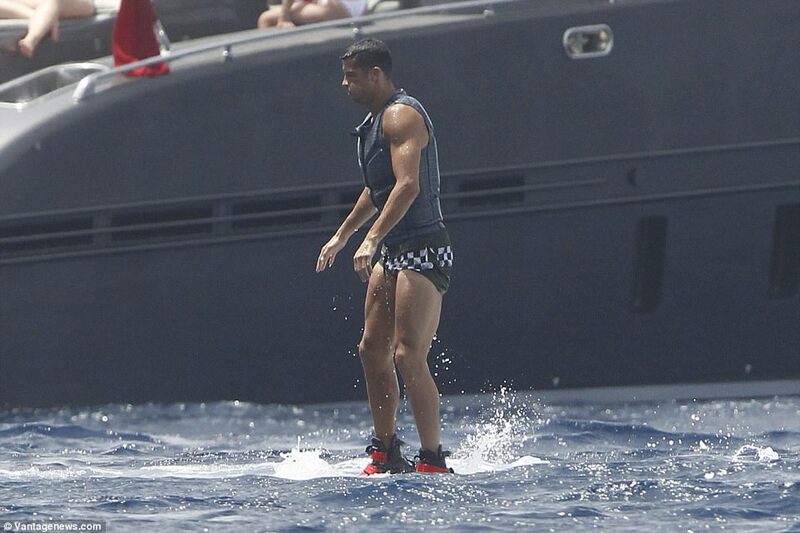 However, Ronaldo has been holidaying hard. He has recently been seen in Ibiza with his girlfriend, Georgina Rodriguez, being a pure water baby! The soccer player dove into the sea, after propelling himself into the air. And, all this, while he was in skimpy monochrome speedos. He did keep calm and composed at the beginning, but he soon started to spiral into the sea. He looked like he was an adrenaline junkie, as he took to the action-packed sport in the water. He seemed to be enjoying himself, putting up a great show of his muscular frame. Meanwhile, his beautiful girlfriend, Georgina Rodriguez, looked stunning in a muti-coloured bikini that showed off her frame. But, it was more than just that – she seemed to show off what looked like a little bulge of her belly. Naturally, questioned have been raised about this. Is this the result of an evolution of her body? Does this mean that the speculations of her pregnancy are true, after all? She was also seen jet-skiing with her boyfriend, which again brings the question: how can she take on an action sport if and when she is pregnant? 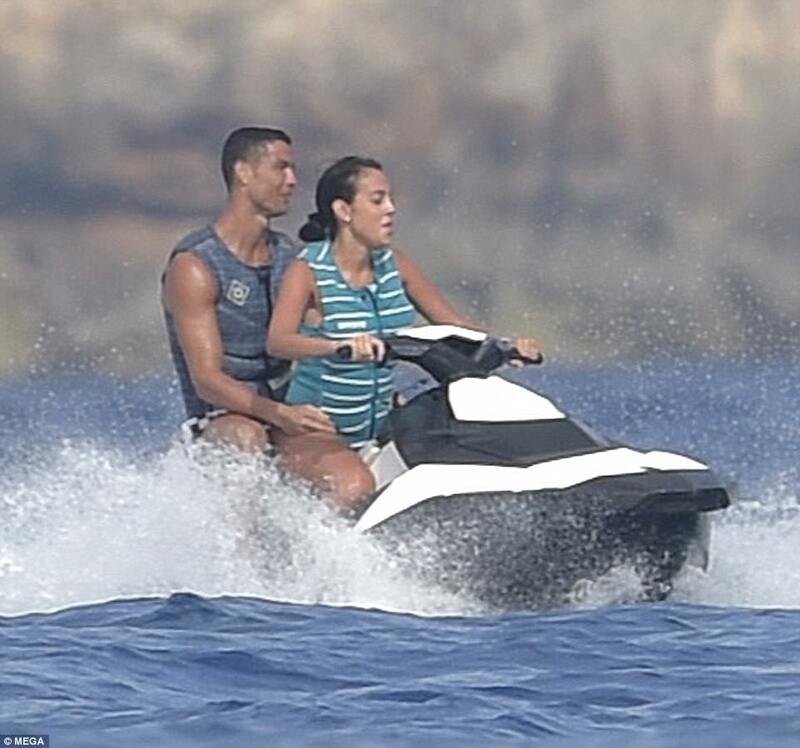 With her wet hair scraped up in a bun for convenience, the beautiful woman looked very much in her element, as she joined Ronaldo out in the waters. The soccer player’s eldest boy, Cristiano Ronaldo jr., also joined the couple very soon, to relax and enjoy with them. Meanwhile, the world is waiting to hear from Ronaldo about his plans of his future with Real Madrid. He has not yet made his decision public, but reportedly, he has only mentioned that he never threatened to leave the club.